this weekend my sister and I went back home to visit our parents. we were both excited to see how the apartment looked like, since my parents had been redecorating for 5 weeks. my room was purple, of course :P and the color almost made me forget that all my posters were gone. on Saturday morning we went rummaging though second hand stores and even though I didn't end up with a big catch, the 3 items that I purchased were absolutely awesome. first, the dress: never in a thousand years would I have imagined that I would buy something golden. it's just against everything I believe in. I don't like anything sparkly, golden, silver, shiny, flashy, neon and so on. for a long period of my life I only dressed in black, so buying a golden dress was quite a risk I was taking. but the vintage print of the dress and the simple shape conquered me on the spot. I thought to myself why the hell not. second, a braided black belt with a big round buckle. it will go very well with skirts, dresses, t-shirts and wife beaters. 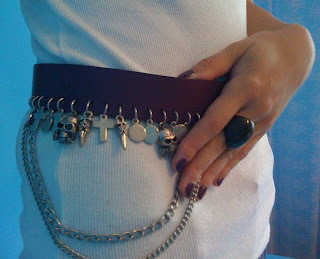 third, the item I am most proud of, a purple belt with punk details. I shall call it my lucky charm belt. there's no point trying to describe just how awesome it is, you will have to see for yourselves.